Whether you love it or hate it, LinkedIn is a global machine. Bought by Microsoft for $26.2 billion, it has over 500 million users globally. But I hear people say “Oh LinkedIn? I have a profile, but I never use it. I’m not moving jobs anytime soon, so I don’t need to use LinkedIn”. And there are three quick things that you can do today to update your profile and make it stand out from the crowd, even if you are not looking for a new job. LinkedIn is so much more than an online platform where you update your profile every few years and apply for jobs. LinkedIn is so much more than an online platform where you update your profile every few years and apply for jobs. It is not a job website or a glorified search engine. There are plenty of those out there already. It’s a place to network, sell, connect, keep up to date with industry news and changes, shout about your achievements and educate and inform yourself about people in your industry. Company Pages have the ability to create a strong employer brand to attract new potential hires and gives companies a place to shout about their achievements. Universities and educational institutions use their specific University Page to promote their own institute, keep in touch with their alumni and promote their research. And yes, you can apply for jobs or post job vacancies but that is only one of the many faces of LinkedIn. Don’t Go To Sleep on Your LinkedIn Profile. I bet there are numerous people out there dusting off an old copy of their CV but it’s so out of date that they quite literally don’t know where to start picking apart years of experience and filtering out what is unimportant or unimpressive. How to turn all those projects, tasks and daily responsibilities into a few succinct points that represents why you are the best person for the job can be daunting and overwhelming, especially if you are coming to terms with a sudden cessation of work or a redundancy. But if you’ve ever read the book ‘Who Moved My Cheese’ by Spencer Johnson you’ll know that you have your running shoes tied around your neck at all times, ready to get up and go without hesitation when the time comes. There are many interpretations of this scenario and it can be applied to many aspects in our work and personal lives. In work, I see this as another way of saying – never go to sleep on your career (and by default, your LinkedIn profile). I’ve seen people work long hours, give 100% to their company, hit every deadline, plough through endless projects and achieve many things. But no one ever knows how much they do. And perhaps even they themselves don’t realise how much they do. We all know these people – they go on holidays for two weeks and the place can’t function without them. But is any of that reflected on their LinkedIn profile? Probably not. And that is why you should spring clean, reboot, update, refresh your LinkedIn profile every few months. If you haven’t updated your profile in a long time, you might need to do a bit of an overhaul. But after that, a small update here and there done regularly after important milestones will keep your profile fresh and relevant. There is huge scope in LinkedIn to show all of your education, work history, publications, skills etc.. but there are 3 things that form the essential elements of LinkedIn. Below are my 3 top tips on what you can do every few months to keep your profile fresh. Every January, I see a rake of updates appear on my feed that this person or that person has updated their title and has updated their work history. And it’s clear that they are preparing to hunt for a new job. There is a button that controls this setting and if you leave this button turned on and say you make a change to the title of one of your work histories. BING. This appears as an update on the feed of your network (depending on their own personal settings). First things first, turn this button off. Go to ‘Me’ (circle with your picture in the top menu bar to the right of ‘Notifications’). If it is set to ‘yes’. Click ‘Change’ to switch this back to ‘no’. Did you know that the little bit of text underneath your name is called the ‘Headline’? 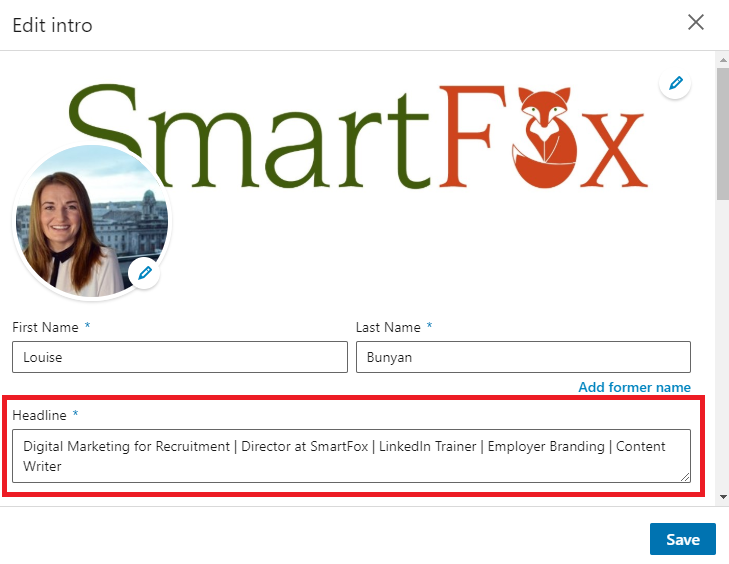 And did you also know that this will automatically default to your job title and company. And did you also know that the headline influences search results? Some of you might be fine with the default option but you have 120 characters to sell yourself and to get some profile clicks. So why leave it at just your job title and company. What does that tell us about you? ​How to decide which words go in the 120 characters? Whenever I deliver LinkedIn training, I ask each participant to make a list of all of the keywords that I would use to search for someone like them. Normally they start off writing their job title, then variations of their job title, and then they start listing their top key skills. Next, they start playing around with variations and adding in some words that give a nod to their personality. In less than 10 minutes they have gone from the (boring) default headline to something lively, interesting and engaging. You could also consider what you’re using your LinkedIn profile for? Or if you are self employed, tell people what you do. Some people use ‘Passionate about…’ or ‘I help people to….’ in addition to the job title and current company. Try out different headlines. Change it around every month or so. Tell your story in 120 characters. How do I edit my headline? 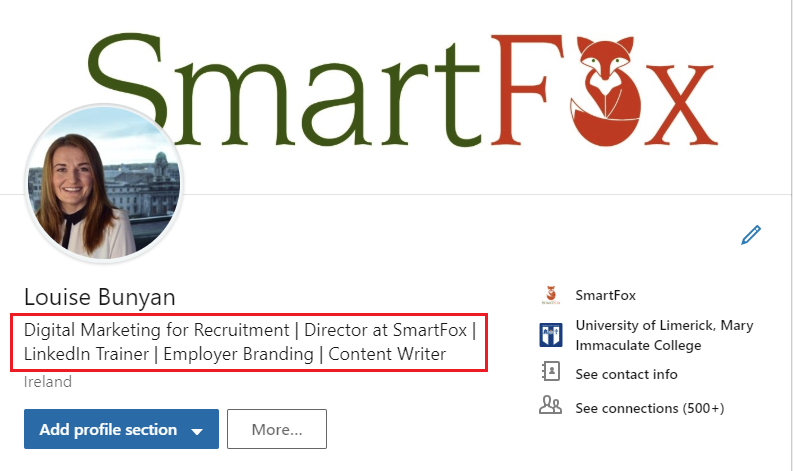 ​To find / edit your Headline section and any of the sections in the top part of your LinkedIn profile look for the blue pencil icon the right of your name. Next, start playing around with variations and adding in some words that give a nod to your personality. After clicking the pencil to edit, all of the sections become editable. The summary section is that small section underneath your headline. Some people might think that it’s just another section complete. But that would be wrong. It’s not just another section, it’s a keyword-rich-paradise of 2,000 characters! And it’s the place where you can tell the world about yourself and tell more of your story. However, only about 30 words / 219 characters can be seen above the ‘read more’ section and this section should be the strongest and pack a punch. Whatever the essentials are, try to squeeze them into 30 words or so. ​What should I write in this section? It’s called the summary section…not the autobiography section. It’s a quick overview of what you do and who you are. But as with everything that looks simple, these things are deceptively difficult to write, especially if you hit the 2,000 character limit and still have more you want to say. You might have to try out a few different versions before you settle on the one that feels the best. If you are job seeking, think of it like a cover letter – a nice summary about what you can bring to a job. If you are selling, recruiting, managing, hustling, think of it as a place where you can tell us more about what you do, who are you and what you can do for us. Imagine you are meeting someone at a networking event for the first time. What is the typical introductory speech that you give? Take out that list you created when you were brainstorming words for the ‘Headline’ section. Those are your keywords and will form the basis of this section. Imagine you are meeting someone at a networking event for the first time. What is the typical introductory speech that you give? That will also form that basis for your summary. Combine the keywords with your speech and write it up in a Word Doc or a text file – that summary box in LinkedIn is awkward to write in and there could be typos and spelling errors that you can’t see. Once you’re happy with the draft in the Word Doc, copy and paste in the text to the summary section, hit save, and then re-read it in your profile. 3 things you can do to quietly update your profile every few months keeping it fresh, relevant and unique. Once you get into your groove, you can come back to these sections and edit them as your career develops. Never go to sleep on your LinkedIn profile and remember that you don’t have to be looking for a job to have a great LinkedIn profile. 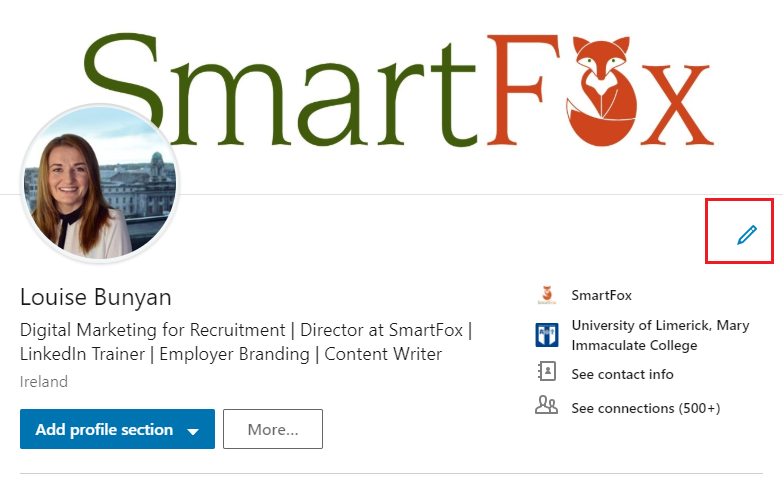 Louise Bunyan set up SmartFox, a digital marketing and training consultancy specialising in recruitment, talent acquisition and employer branding to help companies harness the power of digital marketing to hire faster and better. Louise also creates and delivers a wide range of social media training including hands-on LinkedIn workshops for business owners, professional in-house teams, entrepreneurs and jobseekers. 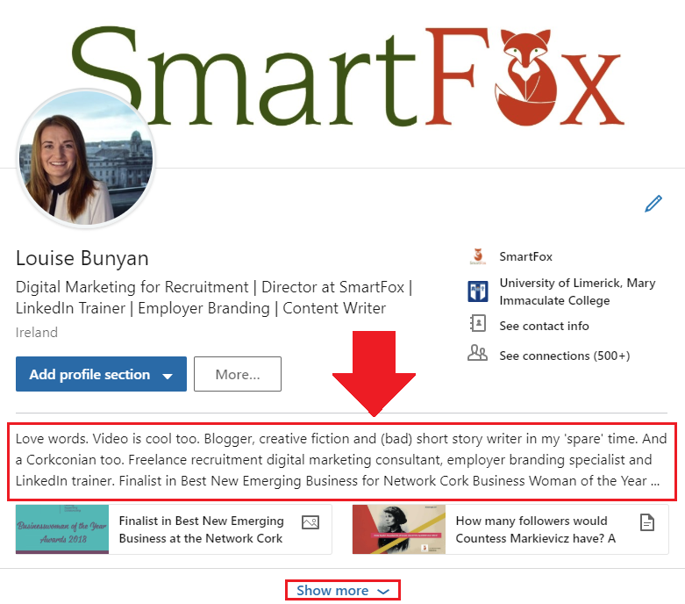 If you are in West Cork and fancy breakfast and an Intro to LinkedIn session on Saturday 7th July at 10am, why not come to the new Brookpark Enterprise Centre in Dunmanway, Co. Cork and attend the Smart Fox Intro to LinkedIn workshop. To book your spot for €10 just go to Bookinghawk HERE and secure your spot.